The U.S. government, the ‘intelligence’ community and their malicious mainstream-media partners in deception just won’t let it go. The underhanded U.S. unitary state, which seeks a unipolar world with the U.S. in charge, still says in its “never ending story” that omniscient, omnipresent Russian leader Vladimir Putin masterminded hacking the computerized systems of U.S. elections as well as Democratic National Committee computers. Then, as the stale tale goes, Russia handed all the resulting electronic juicy tidbits over to Wikileaks, which turned around and dropped a veritable information bomb on America’s delicate democracy. But while that “bomb” allegedly influenced enough people to vote for the winner Donald Trump and not for loser Hillary Clinton, to this day, according to big media, we’re supposed to forget all about the creepy, damning, criminally inclined things contained in the Podesta-Clinton emails themselves. So, let’s try and grasp this media-massaged, intel-infused message: Even though the emails apparently had enough sizzle and scandal to boost one presidential candidate over another, we’re still prodded to think that the information in the emails somehow isn’t the issue—even though the content of the emails will always be what matters the most. Also notice what no one, and certainly no media outlet, dares to mention regarding the other half of this issue: If Putin also was crafty enough to hack into the actual state-level U.S. election systems, then this implies that U.S. elections systems can be hacked in the first place. This is huge. Think about it the next time you use an electronic “ES&S Ivotronic” touchscreen voting machine or Hart InterCivic’s model at the polls. 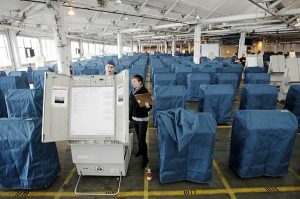 THE ELECTORAL INDUSTRIAL COMPLEX: Securing America’s automated voting systems has become a complicated affair. And, all along, writers like Yours Truly, highly credible Texas vote-reform activists like Laura Pressley, Vickie Karp, Bev Harris and others have uncovered tons of evidence that electronic elections are an immensely deceptive and vulnerable apparatus — vulnerable to external hacking and also to being “fixed” from the inside without any need for outside hacking, through the proprietary software inside the these voting contraptions that can be pre-set to steal elections if the need arises. You’re going to want to see my interview with Laura Pressley, on behalf of American Free Press, through this link right here. As Pressley shows in detail, the integrity and lawfulness of Texas elections are in serious peril — not because of any outside “autocrats” like Putin and his supposed cyberspace minions, but because of state and local election officials, right here in the U.S., who absolutely will not follow state election law. And the average TV or newspaper reporter is utterly tone-deaf to these problems, which keeps the people in perpetual fog, unaware that U.S. elections have been effectively privatized by those who make the machines that count the votes. To hear more about this “Putin the Hacker” debacle, please listen to my Dec. 29, 2016 interview with UK-based radio host Andrew Carrington Hitchcock on his regularly scheduled American Free Press (AFP) show. Furthermore, check out this Election Night Gatekeepers overview on my blog by election-theft expert Jim Condit Jr., who worked with the late Collier brothers in their game-changing book, “Votescam.” The media is part of a secretive consortium that counts the vote in secret, meaning the mainstream press’ fake news carries with it evidence of criminal collusion. The unavoidable conclusion is that the powers-that-be — in going after Putin and calling him The Supreme Hacker of the Known Universe — have shot themselves in the foot because they’re clearly and finally admitting in the process that U.S. voting systems CAN be hacked, after more than a decade of denial. This means that all their denials about electronic election fraud are invalidated. The critics of electronic election systems are right. The establishment is wrong. End of discussion. And, as American Free Press reported in its first 2017 edition, the young owner of a Russian-based web-server company may have a handle on who stole sensitive electronic communications between Hillary Clinton and some of her advisors. But 26-year-old Vladimir Fomenko knows one thing for sure: U.S. intelligence, which professes to be hot on the trail of exposing Russian hacking, doesn’t seem to care about his story. This means that our leaders in Washington have long ignored a solid lead that could prove once and for all whether or not the Russian government hacked the computers systems of top Democrats and U.S. elections systems. Fomenko recently spoke to AFP to try and demystify the controversy surrounding his King Servers company and the cyberattacks purportedly carried out at the behest of Russia. The U.S. was not the only country hit by computer hackers. Hackers evidently targeted Germany, Turkey, and Ukraine, apparently attempting to upset democratic processes. It was when WikiLeaks began releasing hacked data from the DNC late this past summer that media reports and the Clinton campaign began blaming Russia with no solid evidence to support that assertion. After learning about this shadowy criminal activity, Fomenko immediately shut down the servers and looked into the situation. He says he’s willing to cooperate with law enforcement. “We pursued an investigation without delay and found some tracks leading to Europe,” Fomenko told AFP. Georgia Secretary of State Brian Kemp, dissatisfied with the federal government’s dodgy explanation about these DHS cyberattacks, fired off a letter to then-President-elect Donald Trump to put him in the loop. So, it’ll be interesting to see if Trump ever helps Georgia, and other states whose election systems were supposedly hacked, figure out what happened and who’s really responsible. After all this time, the accusation that Russia “did it” still looks less and less credible, as this additional AFP piece outlines, yet the American establishment, thinking it could blame Russia to explain Hillary’s loss and come to grips with Trump’s win, just won’t drop the blame-Putin narrative. We can only hope that Trump’s claim that he’ll start putting some limits on our out-of-control spy agencies will come true. If ever there was a good reason to pursue those limits, this high-level U.S. intelligence gambit to blame Putin, no matter what, is it. The orthodox press has been a solid ally all along of these intel-intrigues. And this gives Trump a chance to prove he’s the real deal, and not another asset of the establishment, despite his seemingly honest intentions to name names and seek real solutions to the real problems that are troubling Americans and citizens across the world. For, if elections are not really a means to find and assign better leaders who will use their victory as a mandate to do the right thing for the voters, then what’s the point of having elections at all, hacked or not hacked, honest or not? TLB recommends you visit 21st Century Wire for more pertinent news and views. About the Author: Mark Anderson is an investigative journalist and features writer for American Free Press, and is editor of The Truth Hound. Contact Mr. Anderson at truthhound2@yahoo.com.